The short-term fluctuations in the stock market obviously can be maddening to anyone with more than a few pennies invested. In the time that I’ve been working on this article, futures prices on the Dow Jones Industrial Average have fluctuated greatly, showing everything from a 300-point loss to a 300-point gain to open Tuesday. The next few days and weeks, and possibly also the next couple months and years, are liable to be turbulent. If your focus is on the long term, however — five years from now as an absolute minimum but preferably 10 or more years ahead — I can offer you at least a little comfort. 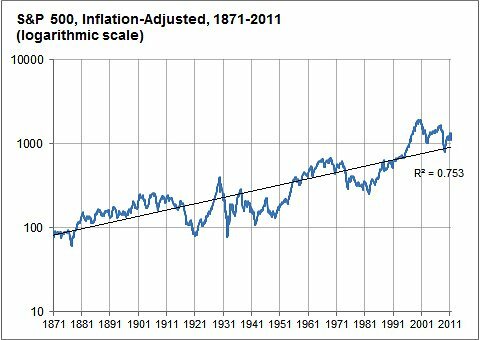 Stock prices, especially in the United States, have had a reasonably strong tendency to revert to the mean. The short version of this is that, although your portfolio may have lost a lot of value over the past couple of weeks, you’re likely to get at least some of that money back (in fact, quite possibly most of it) because expectations for future returns have now improved. The long version of the story flows from something my colleague David Leonhardt wrote about the other day. Mr. Leonhardt, citing the research of a Yale economist, Robert J. Shiller, takes the view that stock prices are predictable to some degree over the long run. Mr. Shiller’s research has found, for instance, that when P/E ratios — the ratio of stock prices to corporate earnings over the previous 10 years — are relatively high, the market is overvalued and tends to produce below-average (although not necessarily negative) returns over the next decade or two. And they produce above-average returns when this ratio is low. There is some debate about the way Mr. Shiller’s ratio is calculated — as well as what the appropriate ratio should be. A bullish view is that P/E ratios have tended to improve somewhat over time, and that something as high as a 20:1 P/E ratio may represent fair value. By that standard, the S&P 500 — which closed with a P/E ratio of 19.3 on Monday afternoon — may now be very slightly undervalued. A more conservative view is that recent ratios have been inflated by the various unsustainable bubbles of recent years, and looking toward the long-term average of about 16:1 is safer. 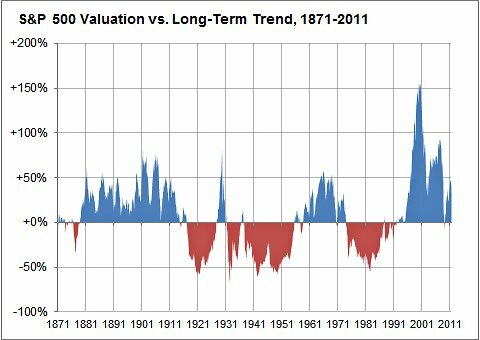 By that measure, the S&P 500 remains about 20 percent overvalued, despite the recent sell-off. Results may vary, and substantially, over the near term — none of this is intended for the sort of people who watch “Mad Money.” But this has been a reasonably reliable long-term benchmark. Anomalies in pricing can persist for several years, and occasionally even for a decade or somewhat more, but gravity gets the better of them sooner or later. Each bubble has been less extreme than the previous one, and stocks even returned to the point where they were slightly cheap for a brief period in 2009. But, although many traders would disagree with these methods, it may not be entirely appropriate to characterize the recent sell-off as a “panic” given that valuations were arguably inflated to begin with. The good news is that a 20 percent overvaluation still implies a profit for long-run oriented investors — a considerably better profit, in fact, than might have been expected several months ago. Historically, the current valuation of the S&P 500 (as of Monday afternoon’s close) has been associated with an annualized return of about 4.3 percent over the next 10 years, including dividends but after inflation. That’s not bad, especially considering that bonds now provide very little premium over inflation. The 4.3 percent figure is a long-term average; returns could be considerably better or worse. The 95 percent confidence interval on this calculation is about 6.3 points, and the errors compound over time. What that means is that $10,000 invested in the stock market today could reasonably be expected to be worth anywhere from about $8,200 to $27,500 10 years from now, adjusted for inflation. Maybe you aren’t ready to buy stocks — but you had some investments already. Those investments have almost certainly lost value. Specifically, you’ve lost about 17 percent of your stake since February if you had been invested in an S&P 500 index fund. However, the improvement in projected returns almost makes up for the loss that you’ve experienced so far. If you had $10,000 invested in the S&P in February, appreciating at a 2.3 percent annual rate, you’d have expected it to be worth $12,602 in February, 2021, according to this formula. Right now, that $10,000 investment would be down to $8,326. But that $8,326 is now expected to appreciate at a 4.3 percent annual rate. That makes its expected value $12,465 as of February, 2021 — barely any lower than before. Or … maybe not. Disclosure: I’m not an especially active investor, although I do have some money in mutual funds and put my money where my mouth is, having pulled a lot of it out in late 2009 when formulas like Mr. Shiller’s suggested that stocks did not represent an especially good value. But this is a familiar debate in the economics literature. 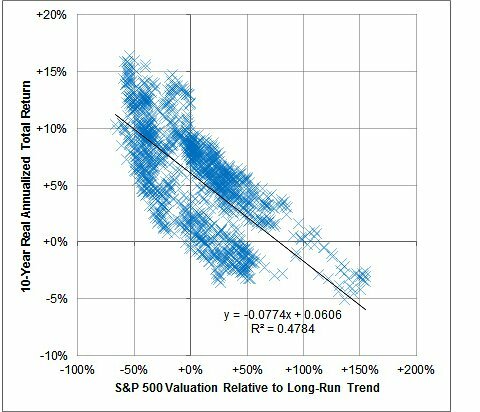 Some economists contend that there is not statistically robust evidence of mean-reversion in stock prices at all, and that its appearance could instead reflect purely random patterns. I tend not to find their arguments entirely persuasive. Stock prices fairly clearly exhibit some nonrandom behavior. For instance, S&P 500 prices have tended to move in the same direction from month to month. Since 1871, a month in which the S&P 500 gains value relative to inflation has been followed by another winning month 63 percent of the time, whereas a loss has been followed by another loss 53 percent of the time. However, there is also a lot of debate about just how strong the mean reversion tendency might be. Some studies put the “half-life” of stock losses at around 2.5 years (meaning, if you lost $10,000, you’d get half of that back in just 30 months). This would imply that, over a 10-year time horizon, you’d recover in excess of 90 percent of any losses suffered during a downturn — plus the normal long-run appreciation from stocks. But another study puts the half-life of stock shocks at 18.5 years, which means that you’d only get about 30 percent of your losses back over a 10-year interval. What all of these studies agree on is that the effects become stronger the longer your investment horizon. If you need to pull your money out in a year for retirement, these effects are weak to nonexistent and unfortunately will not really help you at all. If you don’t need that money for 5 years, though, they should provide you with at least a little comfort. And if you’re looking 10 or especially 20 years out, your long-term outlook may be affected much less than you might think by the recent market action. Or there’s the nightmare scenario. The Japanese stock market, the Nikkei 225, is worth no more today than it was 25 years ago. That case, for now, still looks like an outlier for a developed country. But stocks do entail some risk — that’s why they provide a reward.